But their explanations have changed and at times conflict. In the immediate aftermath of his meetings with North Korea's Kim Jong Un, President Donald Trump said the talks collapsed over sanctions: "It was about the sanctions ... They wanted the sanctions lifted in their entirety, and we couldn't do that," he said in a press conference Thursday. But in the days since his brief time in Vietnam, Trump and his top advisers have offered various explanations for what happened in Hanoi and why he and Kim could not reach a deal, with Secretary of State Mike Pompeo and National Security Adviser John Bolton at times undermining Trump's claims. Their statements have also at times contradicted North Korea's, and with no plans yet for another summit or even more working-level negotiations, the future of talks is up in the air. In particular, Trump said that North Korea wanted all sanctions lifted "in their entirety." But the North Koreans said they want only five out of 11 rounds of United Nations Security Council sanctions lifted, those that target their exports and imports including coal, oil, seafood, and more. 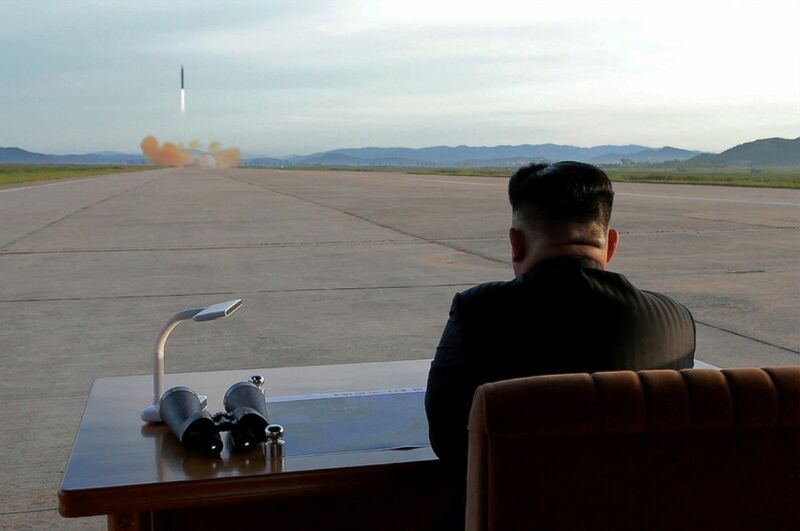 (KCNA via Reuters, FILE) North Korean leader Kim Jong Un watches the launch of a Hwasong-12 missile in this undated photo released by North Korea's Korean Central News Agency (KCNA) on Sept. 16, 2017. To the U.S., that is essentially "all" because it is the bulwark of economic sanctions that have crippled North Korea's economy, but to the North Koreans it doesn't include key sanctions on armaments. While that may be "parsing," as a senior State Department official dismissed it, what's more difficult is the difference over negotiating positions. 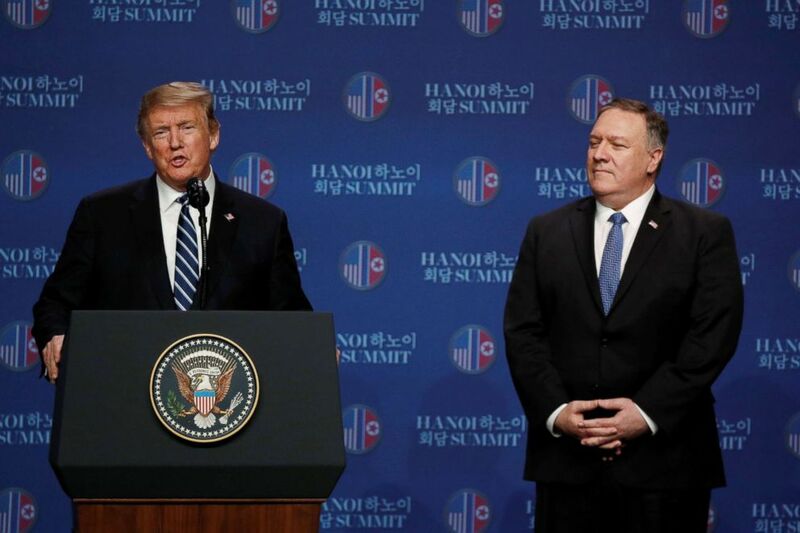 North Korean Foreign Minister Ri Yong Ho, in a rare press statement, told reporters in Hanoi Thursday, "Our proposal will never be changed, even though the United States proposes negotiation again in the future." When asked about that by USA Today, Pompeo blasted the reporter, saying, "That's not what the North Koreans said. Don't say things that aren't true." But when he was read the quote from Ri, Pompeo reportedly "fell silent for about six seconds" before saying, "What they said is they're prepared to continue conversations with us, and that's what we intend to do." 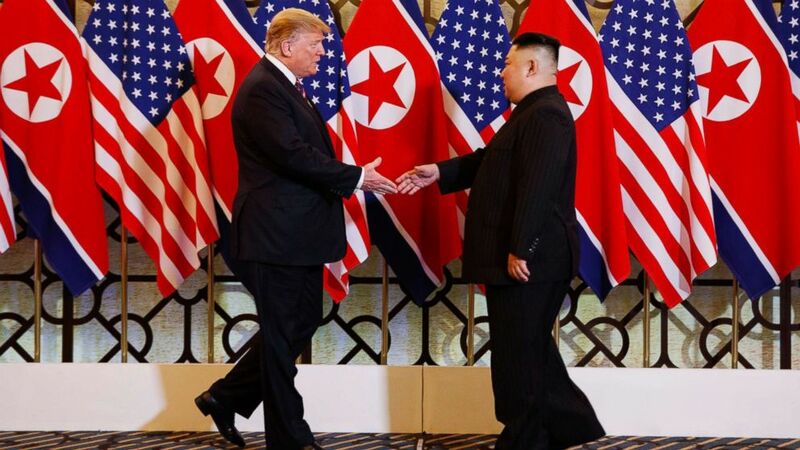 Days after the summit ended with no agreement, when negotiating teams meet again, let alone the two leaders, has not been decided, leaving the road ahead unclear. Pompeo and others have said the "dust" must settle first. That hasn't stopped Trump from claiming forward motion: "We've made a lot of progress, and we'll continue to make progress... Already, I think we're negotiating," he told a crowd of supporters at the Conservative Political Action Conference on Saturday. ( Evan Vucci/AP) President Donald Trump meets North Korean leader Kim Jong Un, Feb. 27, 2019, in Hanoi. The distance between the two sides, however, remains chasmal. A senior State Department official said Friday the two sides still haven't agreed on a definition of denuclearization, and North Korea wouldn't agree to a "complete freeze" of its weapons of mass destruction program, let alone the dismantlement of it that the U.S. seeks. Trump challenged Kim to take "the big deal," according to Bolton: Give up his nuclear weapons program, his ballistic missiles, and chemical and biological weapons, in exchange for "an extraordinary economic future." Instead, Kim only offered the dismantlement of the three-mile nuclear facility at Yongbyon under international inspectors. While Trump welcomed that as "very big, it wasn't enough," he said Thursday. (Jorge Silva/Reuters) President Donald Trump speaks next to Secretary of State Mike Pompeo during a news conference after Trump's summit with North Korean leader Kim Jong Un, at the JW Marriott Hotel in Hanoi, Vietnam, Feb. 28, 2019. But during their joint press conference, Pompeo was quick to jump in that there was much more North Korea would have to do: "There are also timing and sequencing issues ... Remember, too, even that facility ... still leaves missiles, still leaves warheads and weapons systems... And a declaration. So all of those things, we couldn't quite get there today." While Pompeo made it seem like they were close, it's clear from the North Koreans that none of those other things were on the table during the summit or in the days of working-level negotiations leading up to it. Just as important to the future of talks, the differences between Trump and his advisers have also been on full display in the days since the summit, especially with Bolton. In a series of interviews on Sunday, the hawkish adviser made a repeated distinction clear in his answers -- talking about the president's view, rather than his own. When pressed at one point, Bolton told CNN, "My opinion doesn't matter... I am not the national security decision-maker. That's his view." 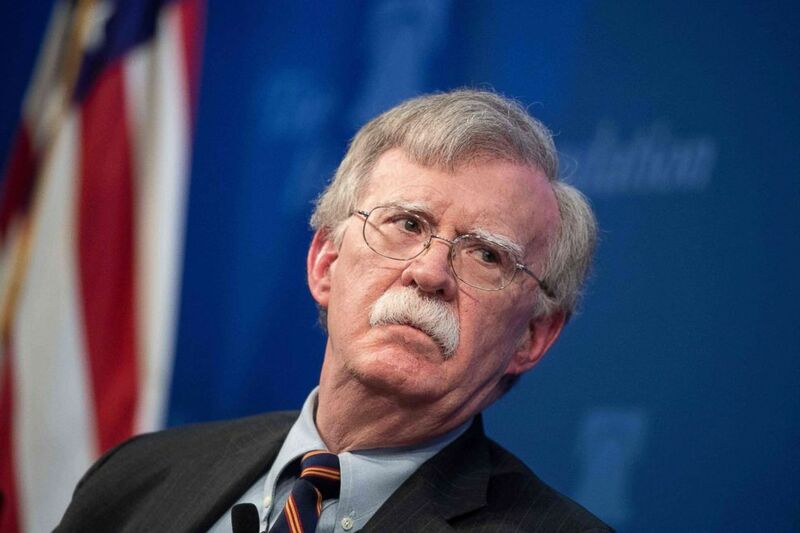 (Nicholas Kamm/AFP/Getty Images) National Security Advisor John Bolton speaks about the administration's African policy at the Heritage Foundation in Washington, DC, Dec. 13, 2018. But it's telling to see the answers where Bolton specifically references the president's beliefs. When asked whether Kim continues to gain from these summits -- which include state visits to countries and appearing as a world leader on the global stage -- even as talks stall, Bolton told CBS News repeatedly, "The President's view is he gave nothing away." Trump has canceled further joint military exercises with ally South Korea -- a major North Korean demand for years. Asked if that was a concession, Bolton told Fox News, "I don't think the president sees it that way at all." Bolton even hung any optimism for North Korea finally agreeing to the U.S. offer on Trump, too: "He remains optimistic that this is possible," he told CBS, adding the U.S. had to walk because North Korea wasn't there yet. But Trump threw that story off, too, tweeting hours later that his former lawyer and fixer Michael Cohen's testimony on Capitol Hill "may have contributed to the 'walk.'"